Wash potatoes and cut in half lengthwise, skin on. Spread 2 tablespoons (1 ounce) of oil in each steamtable pan. 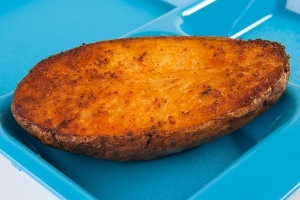 Place 13 potato halves in each pan, cut-side down, to lightly coat potato surface with oil. Turn cut-side up. 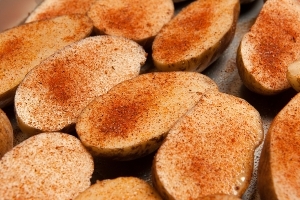 Sprinkle seasoned salt over potatoes. 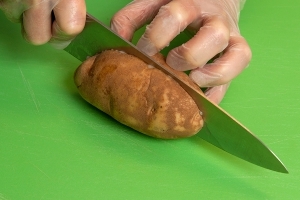 Turn potatoes cut-side down for browning. Conventional oven: 450 degrees F for 25 to 30 minutes. Convection oven: 425 degrees F for 20 to 25 minutes. Bake until the surface is golden-brown. Remove from oven. Cover pans and place in warmer until ready for service. Portion 1 potato half per serving. Each portion provides ½ cup of starchy vegetable.